Margaret George is an author I’ve been meaning to read for years now. I own her famous books about Cleopatra and Henry VIII. I’m pretty sure that I also own her book on Mary, Queen of Scots. However, her books are so long that I don’t have time to read them since I’m in my last year as an undergraduate. Reading for pleasure is a distant dream in my life. My saving grace is where I work; a warehouse that just allows me to listen to stuff all the time, so I listen to books. Basically, for a book that’s about 500 pages, it’s optimal for me to listen. 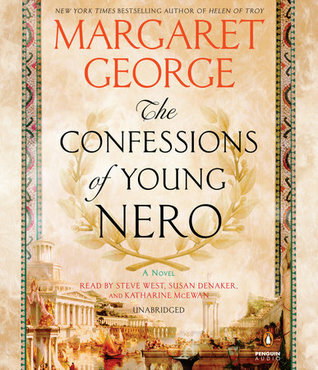 George doesn’t disappoint in her epic about Nero. She’s pretty well known for taking historical figures who have been slandered for whatever reason, then twisting the known facts in a way to make it them shine. This story starts in about 41CE and spans until 64CE. Basically from Nero being four to being twenty-three. It’s an epic in proportion, honestly. George handles all of the information evenly with good pacing. Nothing felt too slow or too fast. Now, usually with historical fiction, I’ll go off and rant about historical accuracy. However, I don’t know much about Ancient Rome. My area was Ancient Egypt, mainly about Cleopatra. I know enough Roman history to get by. Everything I know about Nero is negative. He was frivolous, artsy, not fit to be Emperor. He fiddled as Rome burned. Not a good guy. George took that information then showed that he was good. She never disputed the bad things that he did do but put them into some perspective. That takes a talented author, honestly. Her afterward went through why she made these assumptions, logically telling you why. There are only two things I want to critique about this book. The first is the length. As I said, it’s great with pacing. For how much information this book covered, it had amazing pacing. George didn’t leave anything out. Every so often, I’d check on Wikipedia about something to find that it happened or there were rumors of it happening. Some things I felt could have gotten left out. Just too repetitive and accomplished nothing. Same with the reiterations of parallels between Nero, Paris, and Apollo. The second thing is the multiple POVs. Nero is the main POV. Then, there are two others. Locusta, a poisoner that he runs into multiple times, and Acti, a servant who is devoted to Nero despite ties to others. Both of those POVs added nothing to the story. It felt like it was showing over telling me what was going on. There were other ways to inject what they said and suddenly switching POVs for a chapter that were barely pages long, it just didn’t make any sense to keep it. Because I enjoyed this book so much, I’m totally looking forward to the sequel to this book so I know how it ends, and I’ll have to try carving out time to read George’s books that I actually own.